Originally posted on Nesting Newbies blog. If you're anything like me, finding time to shop for the perfect gift is always a challenge. My strategy is to have a few things on hand that are great gifts for almost anyone, so I'm always prepared. 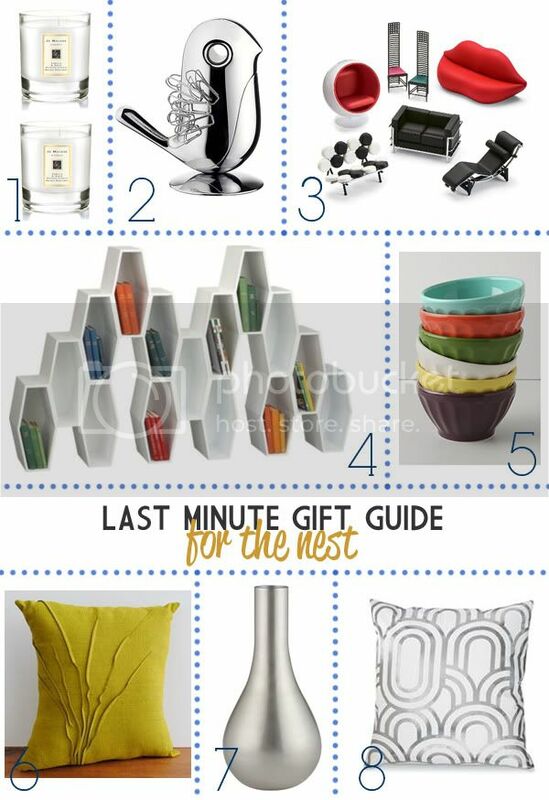 Since you're reading Nesting Newbies blog I know that you love nesting as much as I do, so above you'll find last minute gift ideas "For the Nest"! 1. Add a luxurious aroma to someone's home with a Jo Malone candle. 2. For the Twitter fanatic who keeps a neat desk, this magnetic paper clip holder is absolutely adorable.3. Your favorite interior designer will love these miniatures of classic chairs! 4. Store things in style with a chic & modern shelf system from CB2. 5. Foodies can never have enough dinnerware, and these bright bowls from Anthropologie are perfect for their homemade soups. 6. Your eco-friendly friend will adore this gorgeous pillow made with green materials. 7. Keep your loved one's flowers looking great all year long with this svelte vase. Tip: Fill it with candy cans and tie a bow on it! 8. And for the vintage glamazon in your life, grab this art deco metallic pillow! umch room reveal + see it for yourself! get kim's look - for less!